I got my introduction to using the VLA back when it was only a PBA (Pretty Big Array), as an NRAO summer student with Thijs van der Hulst in 1978, analyzing a survey of galactic nuclei (some folks would see a pattern here). Later, I did some solo work on jets (most notably a mixed-array observation of the cool jet in PKS 0521-36, yielding a map which was later reprinted in comparison with HST imagery). I also worked with Jim Condon on galaxies with radio-bright disks, notably NGC 2276 and NGC 1961 which we got back to by adding ROSAT measurements about 10 years later. 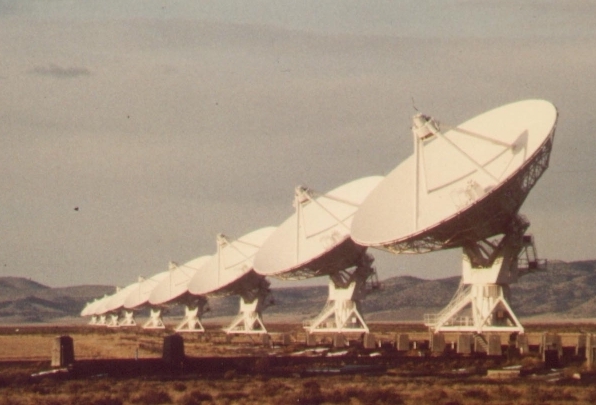 Here's a view of the north arm of the array, when warm weather produced mirages seen in front of the more distant antennae. To show an example of VLA data in various stages of processing, these images show various stages in processing the 2-centimeter data on PKS 0521-36. It was fun to watch the array tracking quite that low in the sky, but still not as bad as the folks working on Centaurus A. 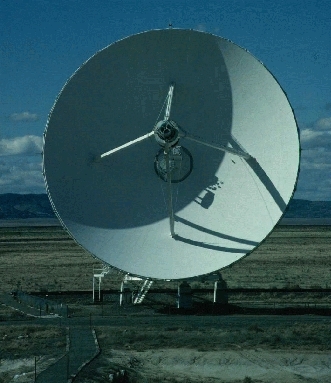 In act, the picture to the left was taken while these observations were under way, affording a good look at the business end of a VLA antenna. 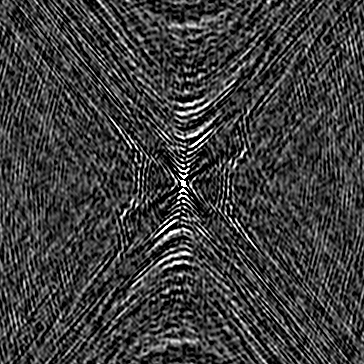 The first image is the so-called raw or dirty image, made by taking the inverse Fourier transform of the correlated intensities measured by all possible antenna pairs (351 when they're all working) with each pair put at the distance and direction corresponding to the projected baseline between the antennas as seen from the source at the time of each observation. This shows all manner of ripples and false features, caused by the fact that even the VLA misses many possible intermediate spacings and directions. 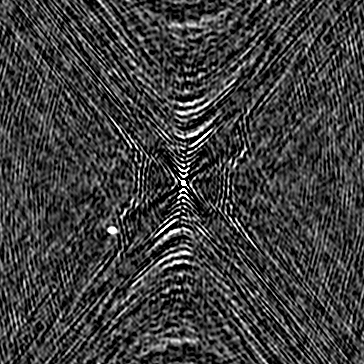 The second image shows the pattern expected for a point source when processed in this way, the so-called beam pattern. 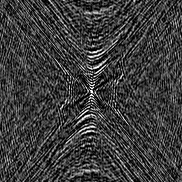 Finally, after using an algorithm known as CLEAN to remove this effect, we get the final image of the source, showing structure that was not at all apparent on inspection of the original data. (By the way, a version of this algorithm appropriately modified for the different nature of measurement noise in the optical regime can work on optical data as well). 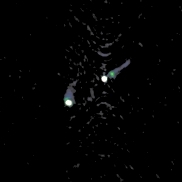 These data were taken with a hybrid A/B array (north arm of the larger A array, southern arms of the B array), giving a rounder beam pattern when working deep in the southern sky, and have a resolution of about 0.30 arcseconds (full width at half-maximum). The final processed image show the bright core, a hot spot to the southwest, and a detailed jet to the northeast. 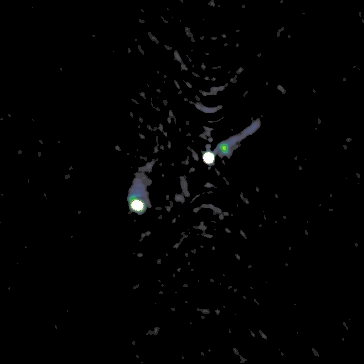 This jet is also detected optically, being the third brightest optical jet known (this map has shown up in a couple of more recent papers, in comparison with HST images). The arclike features north and south of the core are residual artifacts from the core itself, which is enormously brighter than the jet. The NRAO 140-foot telescope towers above the Green Bank landscape, with what is probably the largest equatorial mount ever built (moving weight listed as 2500 tons). 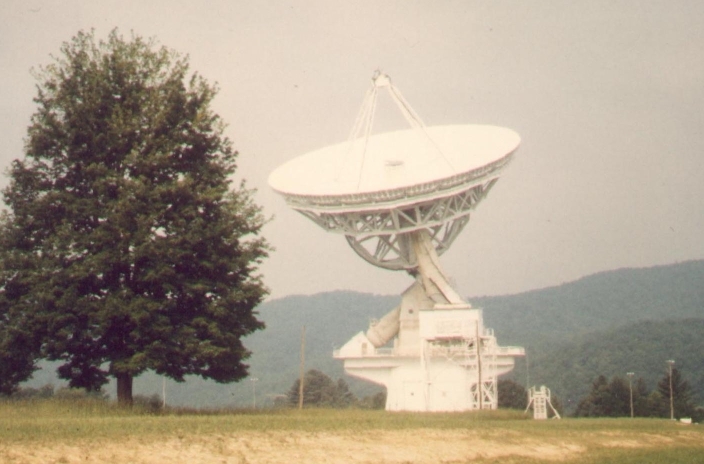 Until the upcoming advent of the 100-meter Green Bank Telescope (GBT), this was the largest instrument in the US community which could track an object for long times. While a summer student at NRAO, I went along with my advisor for an observing run (coinciding with my tour of duty running the public talks there, and requiring bicycling back and forth between the site entrance and telescope every hour) and did a 21-cm H I observation of the peculiar spiral galaxy NGC 3312, which may or may not be a member of the Hydra I cluster and may or may not be affected by the cluster medium. Either way, our data quality was not sufficient to say, and these data were substantially improved on by later VLA data obtained by McMahon et al. This instrument is slated for phaseout as the GBT comes in to operation in the next couple of years. The left-hand image below shows how to get access to the focal plane for work on the receivers - tilt the telescope way over until it meets the rising tower. 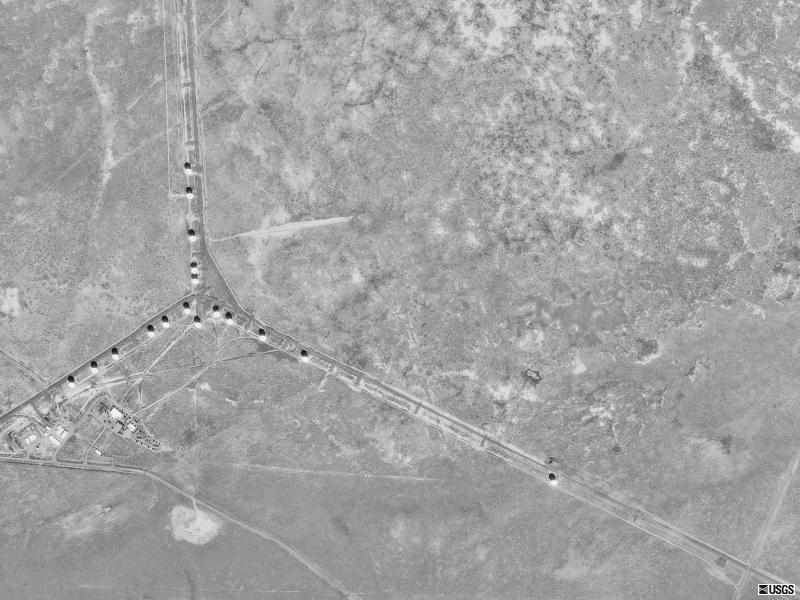 The site appears in a satellite image from Google Maps. 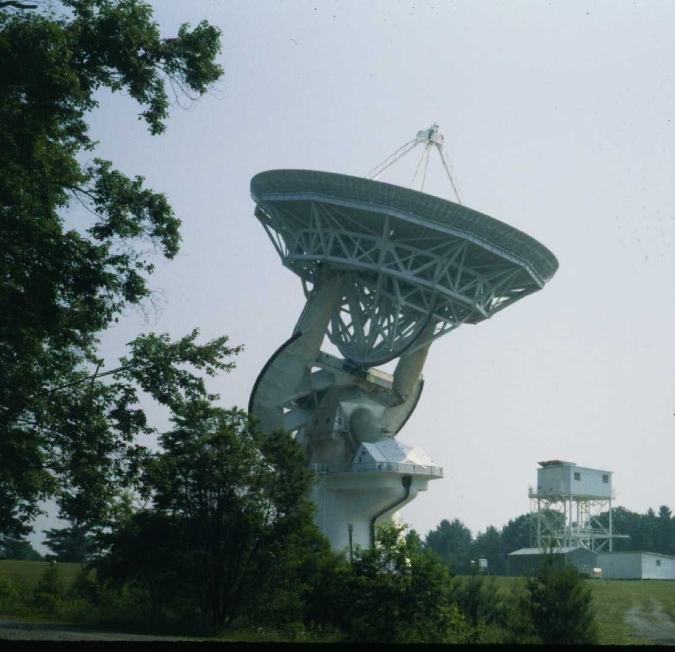 This was taken after the collapse of the 300-foot telescope, and its replacement by construction of the Green Bank Telescope. The 43-meter telescope is prominent, as is the track containing the three elements of the Green Bank interferometer. 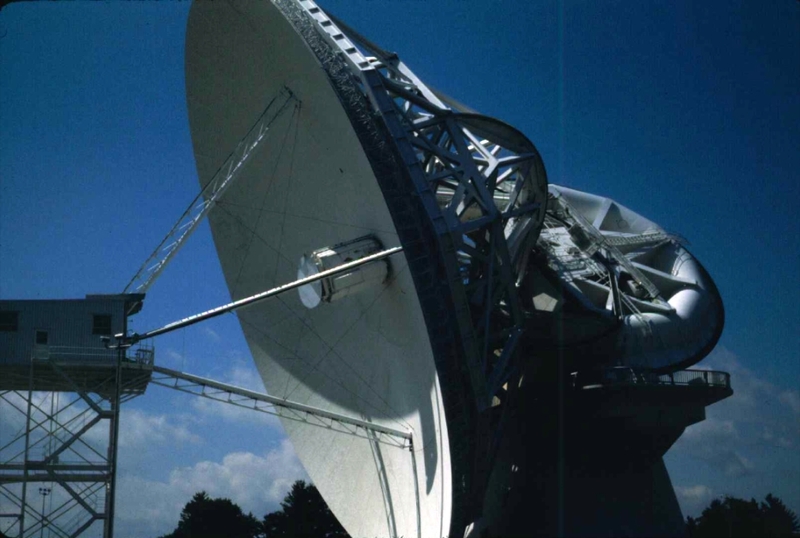 The sharp-eyed will also find the 40-foot dish used for summer educational programs, a horizontal calibration horn, and a duplicate of Grote Reber's 36-foot parabolic dish.